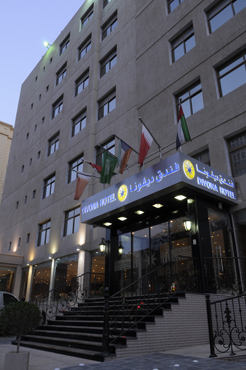 From the heart of Kuwait City – Bneid Al-Gar area specifically, and minutes from the famous Gulf Road, one of the main touristic attractions in Kuwait, Divona Hotel offers a variety of options catering for different guest needs. If you are in a business trip or in a family vacation, Divona Hotel would be the perfect choice for you and your family. We are 5 minutes away from Kuwait’s financial hub, and close to many bustling malls, luxury shopping centers, restaurants, cafes, and other touristic attractions. Divona management strives to maintain homey accommodation feel by designing and furnishing the hotel, its rooms and suites according to the best international industry standards, a charm that you feel once you step in the lobby. Spaces of rooms, suites, and hallways are well thought of to cater for shorter and longer stays. The hotel has a café, a restaurant, and a 24/7 room service, in addition to a wide array of services and facilities reflecting the well-known Arabic hospitality with a modern twist.